Stef Gijssels, Free Jazz Blog: “The music is ambitious, and amazing: it creates a semi-dense and warm sonic universe in which instruments ebb and flow into a common pool of sound, in which individual voices are still identifiable, yet are irrelevant on their own. The atmosphere is open, neither dark nor optimistic, and brings to mind images of organic growth in nature, in which a wild yet seemingly organised whole comes into existence out of strangely unrelated and unpredictable components. The only thing that keeps them together is the listening…” Full Review Here. Kevin Press, Bad Press: “This is high-brow music in all the right ways. Serious, inventive and demanding of skilled performers. Hip not stuffy…Beautiful, inspiring stuff.” Full Review Here. Bruce Lee Gallanter, Downtown Music Gallery: “Although the there nine musicians on this session, the sound is more spacious, balanced and well-crafted. There is a dreamy, drifting quality during the first long piece here…they create their own magical audio environment…” Full Review Here. 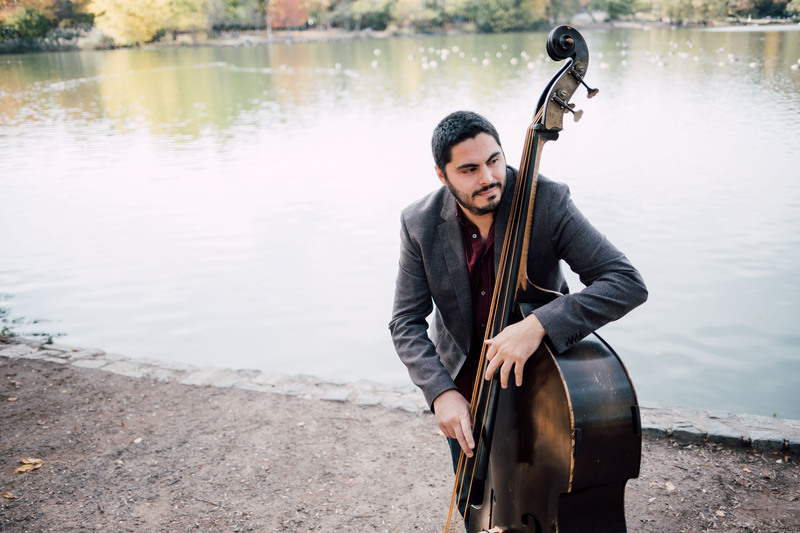 Raul da Gama, Jazz da Gama: “It pays to emphasise the fact that one is not likely to hear a recording that spotlights the contrabass quite like this one does…Much of what has been achieved on Hecate’s Hounds has to do with the twice purified echo of the sound of his contrabass – once as it’s sculpted sound comes off these strings and again when it bursts forth from the woody cavern of the body of the instrument, caressing every nook and cranny inside and hugging the dark varnish before leaping into the atmosphere of the room where (your) speakers are placed…All this plus a warm acoustic from an engineer, Michael Perez-Cisneros, who saw the big picture and and captured the smallest details, and a courageous boutique label that put this recording out. The result is the sound of music to die for…” Full Review Here. Ron Schepper, Textrua: “In featuring two instruments only, the ten-track recording exudes a rather intimate and oft-introspective character. Improvisation plays a significant part, but there’s compositional structure too, which makes for both a satisfying balance and listen…In the time-honoured spirit of jazz improvisation, much of the album plays like conversations unfolding in real time, with each player attending closely to the other and responding in kind…” Full Review Here. Chris Spector, Midwest Record: “An introspective instrumental duo that has the same feel as boundary pushing as early 70s works that you almost didn’t know whether or not to call jazz lands their debut in fine style…A worthy side trip for the open eared.” Full Review Here. Bruce Lee Gallanter, Downtown Music Gallery: “The Dogwood duo wrote all of the pieces here…“Causes” opens this disc with an exquisite, restrained, lovely sort of ballad, rather Jim Hall-like in its gracefulness. On “It Must Have Been the Wind”, the duo play as if they were playing an old, beloved standard, soft, warm and most charming. “Aokigahara” is both haunting and breathtakingly lovely as well as stripped down to just its bare essentials…It is refreshing to hear a record that embraces a more quaint, pure, gliding on the wind, sort-of vibe. Unlike anything I’ve heard in quite a while.” Full Review Here. Andrea Aguzzi, Neu Guitars: “A complex, difficult, almost millimeter equilibrium where every variation corresponds to a different brushstroke from the palette of an Impressionist, where every alteration can result in an error or a subtle element of style.” Full Review Here. Fernando Dauli, La Riviera News: “Hecate’s Hounds è un lavoro introspettivo, che lascia grande spazio a momenti di lirismo e di meditazione e si lancia con curiosità in direzioni ed ambienti musicali diversi. Alcune tracce (come Aokigahara e Bassifondi) sono evocative e riconducono – attraverso l’improvvisazione – alle sensazioni suscitate dai più diversi ambienti, come le foreste orientali o i cupi angoli delle metropoli. Altri momenti del cd sono vere e proprie ricerche musicali tra diversi contesti armonici (It Must Have Been the Wind, Lonely proposition); altre tracce sono viaggi nelle strutture classiche del jazz (What Conclusions Am I left to Draw) o ancora vere e proprie esplorazioni delle diverse modalità di improvvisazione, variamente restituite in Crevasse, Causes, Gumtree Canoe ed Expanding Blue.” Full Review Here. Robert Bush, NYC Jazz Record: “With steady certainty, they build toward a climax and everyone contributes to the unfolding drama…Strange and beautiful, this album requires and rewards careful listening.” Full Review Here. David Ellenbogen, NYC Radio Live: “Zachary Swanson was on upright bass, totally right on and just amazing…how Zachary was able to think compositionally, and come in at the perfect time during improvisational parts…” Link to Podcast Here. Michael Block, Long Island Pulse: “…top-shelf sideman Zach Swanson, on stand-up acoustic bass, is largely responsible for the unwavering bottom end…” Full Article Here.